In contrast to the strong economic and diplomatic ties with Israel, many local non-governmental organizations (NGOs) are active in promoting BDS (boycott, divestment, and sanctions), lawfare, and various other delegitimization campaigns against the State of Israel. These campaigns are often accompanied by demonizing and antisemitic rhetoric. These organizations appear to receive no government support and therefore rely on international BDS groups, as well as American, European, Israeli, and Palestinian NGOs for assistance in their campaigns. There is, however, an overall lack of transparency on both the part of the NGOs and the government donors, reflecting a lack of accountability. Ecumenical Accompaniment Program in Palestine and Israel (EAPPI), a program of the World Council of Churches that brings volunteers to the West Bank for three month periods, also has a strong presence throughout Latin America. EAPPI volunteers consistently demonize Israel; make accusations of “apartheid,” “war crimes,” and “Bantustans”; and are leaders of BDS campaigns in their home churches. Allocate resources to map and understand the anti-Israel network in Latin America. Conduct additional research focused on understanding each country’s civil society, funding, and government involvement. Present the findings to the governmental and private donors of local and international NGOs, encouraging the importance of greater oversight, transparency, and accountability. BDS (boycott, divestment, and sanctions), lawfare, and other political campaigns are often conducted simultaneously across Latin American countries. Similarly, at times, these efforts take place in conjunction with activities of American, European, Israeli, and Palestinian groups. In April 2017, an official of PIT-CNT, the national trade union in Uruguay, spoke at a center belonging to the Zionist Organization of Uruguay. Organizations in countries across Latin America wrote a letter calling for PIT-CNT to cancel their speech as the Palestinian people “have lived for almost 70 years under the Israeli regime of military occupation, colonization and territorial apartheid” and called for PIT-CNT “not to be complicit in the violation of the human rights of the Palestinian people and their right to self-determination” (emphasis added). EAPPI was founded in 2002 by the Geneva-based World Council of Churches (WCC) and is considered to be the WCC’s flagship project on the Arab-Israeli conflict. The program brings international activists to the West Bank through the ruse of tourist visas with its stated mission being to “witness life under occupation…” Upon returning to their home countries, many EAPPI activists promote anti-Israel campaigns, including promoting BDS. 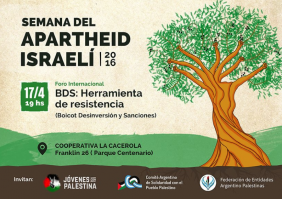 BDS Argentina is a coalition of 11 organizations (Comité Argentino de Solidaridad con el Pueblo Palestino, Federación De Entidades Argentino-Palestinas, Jóvenes con Palestina, Asamblea Permanente por los Derechos Humanos, Liga Argentina por los Derechos del Hombre, La Fede – Federación Juvenil Comunista de la Argentina, Tucuman por Palestina, and Frente Unico IR-HN). Its website features information on academic, cultural, economic, and political boycotts and sanctions. 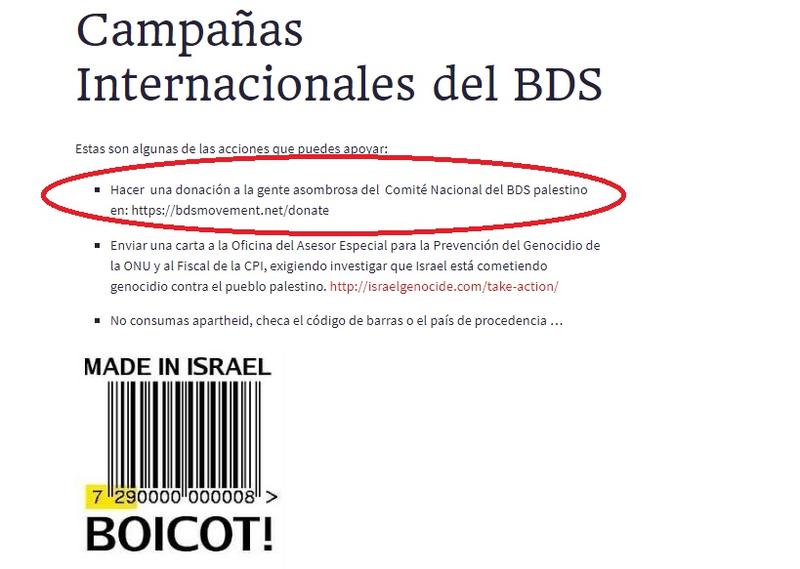 BDS Argentina’s website incorporates material from various Israeli and Palestinian NGOs. It refers to Palestinian Campaign for the Academic and Cultural Boycott of Israel’s (PACBI) guidelines for academic boycotts to “help those early academics and academic institutions around the world act in accordance with the Palestinian call to boycott,” and includes its recommendations for a “boycott of Israeli academic and cultural institutions…based on the fact that these institutions are part of the ideological and institutional machinery that sustains the regime of occupation and apartheid against the Palestinian people.” BDS Argentina also calls for individuals to “Write letters to the management of the companies asking them to stop financing apartheid” and to “search the Who Profits site to see who are accomplices.” Who Profits is an Israeli NGO that initiates international BDS campaigns, targeting Israeli and foreign banks, security companies, civil infrastructure facilities, and private companies, and identifies targets for anti-Israel divestment and boycotts. APDH participates in BDS campaigns and accuses Israel of “crimes against humanity, ethnic cleansing and the implementation of terrorism against Palestine.” In September 2017, Frank De Nully Brown, APDH’s Secretary of International Relations, “repudiated” the visit of Netanyahu to Argentina since “he is responsible for crimes against humanity that are occurring in the Gaza Strip.” APDH signed the Cemex BDS call and released a “Declaration of Repudiation,” demanding that the “Argentine State stop trading with a State that violates the human rights of the Palestinian people…We do not want to be victims of the arms of the State of Israel. We do not want an Argentine State complicit in the violations of human rights against the Palestinian people.” In April 2016, APDH signed a letter to Congressmen and constitutional magistrates of Colombia calling to “stop the ratification of the Free Trade Agreement between Colombia and Israel, until Israel complies with its international legal obligations,” as “Israel has systematically and gravely violated UN resolutions and international humanitarian laws relevant to human rights, undermining the right of the Palestinian people to self-determination…The ratification of the Israel-Colombia FTA would give legitimacy to this illegal situation.” Other signatories to the letter include the Palestinian Campaign for the Academic and Cultural Boycott of Israel (PACBI), Palestinian NGO Network (PNGO), Popular Struggle Coordination Committee (PSCC), Stop the Wall, Israeli Committee Against House Demolitions (ICAHD), Association France Palestine Solidarité (AFPS), War on Want. 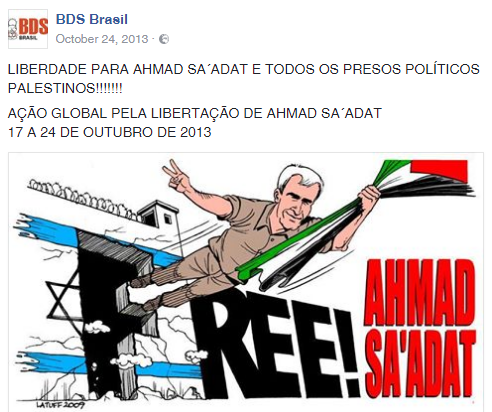 The emergence of BDS in Brazil coincided with the presidential administrations of Luis Inácio Lula da Silva (2003-2011) and Dilma Rousseff (2011-2016), both of the left-wing Workers’ Party. Under their administration, various Brazilian NGOs, including Brazilian Small Farmers Movement (MPA), the Popular Youth Uprising, and the CUT Trade Union Federation, launched a campaign against the Israeli companies Elbit Systems and Mekorot, who had signed agreements, respectively, with the state governments of Rio Grande do Sul and Bahia. The Elbit deal, which was protested over “Elbit’s role in the construction of Israel’s illegal apartheid Wall in the occupied West Bank and its close relationship with the Israeli military,” was cancelled in 2014, while the Bahia-Mekorot deal, that “served to legitimize Israeli water apartheid without even giving any benefits to Bahia,” was cancelled in 2016. 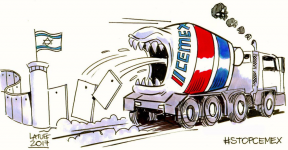 In June 2017, Fremte signed a letter calling for the Mexican company Cemex to “withdraw its participation in the process of colonization, apartheid and occupation that Israel has carried out for 69 years against the Palestinian people” (emphasis added). In January 2016, Fremte was a signatory on an open letter opposing the appointment of Dani Dayan as the Israeli Ambassador to Brazil claiming he “openly defend[s] the Zionist project of a homogeneous Jewish state, without Palestinians, throughout historic Palestine.” During the same month, Fremte published a letter denouncing Brazilian MP Jean Wyllys for participating in an academic conference held at Hebrew University in Jerusalem as “Israel’s tactic of inviting personalities and authorities to attend lectures in its academic institutions…aims to convey to the world the idea of ​​normality while maintaining apartheid, colonization and occupation of Palestinian lands.” In April 2013, Fremte participated in protests against the presence of Israeli companies at the Latin America Aerospace and Defense Exhibition (LAAD) in Rio de Janeiro. MOPAT, based in São Paulo, was founded by Brazilian-Palestinian activists in January 2008, primarily to participate in a campaign against the negotiation and implementation of the planned free trade accord between Israel and the Mercosur bloc. 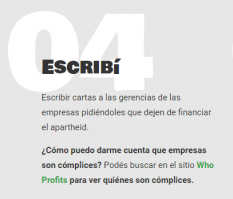 In April 2015, Henrique Sanchez of MOPAT co-authored an article with Stop the Wall’s Maren Mantovani accusing Israeli security companies of contributing to police brutality against the people in the Brazilian favelas. In April 2013, MOPAT participated in protests organized against Israel’s presence at the Latin America Aerospace and Defense (LAAD) fair in Rio de Janeiro. There have been numerous BDS campaigns at academic institutions throughout Chile, including cancelling events sponsored by the Israeli Embassy and the University of Chile voting to break institutional ties with Israeli universities. 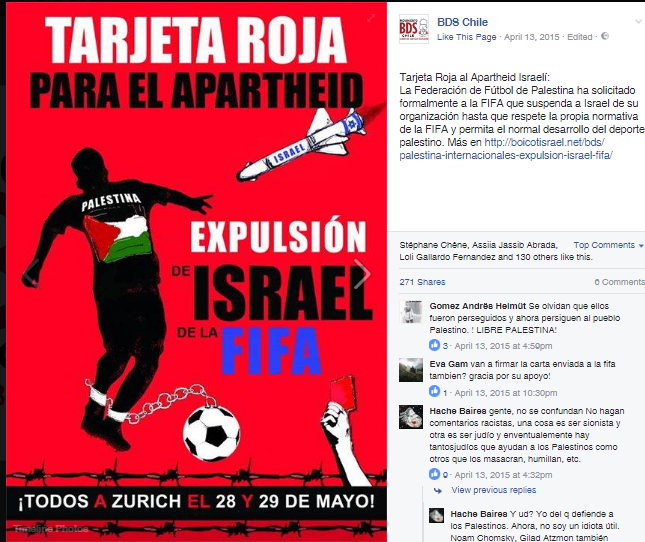 BDS groups in Chile have also attempted to link the Israeli-Palestinian conflict with Chile’s historical and current political conflicts, such as the Pinochet dictatorship, the impact of neoliberal economic policies, and Mapuche land rights campaigns. In April 2017, Anuar Majluf, the executive director of the Palestinian Federation of Chile, was barred from entering Israel due to his leadership role in BDS campaigns. The Palestinian Federation subsequently warned the Jewish community in Chile not to “play with fire” – demanding that the Chilean government end its visa-free agreement with Israel. In response, Majluf called for Chile to ban Israeli tourists from entering Chile. In April 2012, Federation president Mauricio Abu-Ghosh was barred from entering Israel. In August 2012, Abu-Ghosh compared Israel with Nazi Germany in a radio interview, stating that “the Nazis were boys compared to current Zionists” (emphasis added). The Liga Mexicana por la Defensa de los Derechos Humanos (LIMEDDH) was established in 1985 as an “open, independent and plural forum to promote and protect human rights.” LIMEDDH states that it “receives financial aid from funds, both national and global, for the development of our operations and projects. We are also pleased to have, among our partners, organizations and people who make their donations, whether public or anonymous.” LIMEDDH is a member of the International Federation of Human Rights (FIDH), an organization comprised of 178 organizations throughout the world, and which engages in lawfare, supports BDS campaigns, and abuses its reputation as a human rights organization to condemn Israel in a variety of international forums. Coordinadora de Solidaridad con Palestina (CORSOPAL) states its objective is to “express solidarity with Palestine and the end of the Israeli occupation.” Its rhetoric includes accusations of “genocide,” “apartheid,” and “war crimes.” CORSOPAL also supports BDS campaigns including the Cemex call and participates in campaigns in support of Palestinian prisoners. December 14, 2017 An Ecumenical Accompanier recounted his experiences at the “Christmas Alert 2017: About Advent Time and Christmas in Occupied Palestine,” an initiative of Kairos Palestine. November 29, 2017 To mark the International Day of Solidarity with the Palestinian People, EAPPI activist Ivan Vivas gave testimony about his experiences. March 14, 2017 Hosted the “inauguration of the photographic exhibitions” titled “Postcards for Palestine" and "Being a child in Palestine” featuring images taken by ecumenical accompaniers. September 23, 2016 In coordination with Koinonia, FUMEC-ALC, and the Ecumenical Youth Network, EAPPI - Brazil hosted an event “Celebration for Peace in Palestine and Israel” where EAPPI activist Wallace Gois spoke. May 21, 2016 Hosted a photographic exhibition “Palestine - across the walls” featuring photos taken by EAPPI activist Renan Leme. 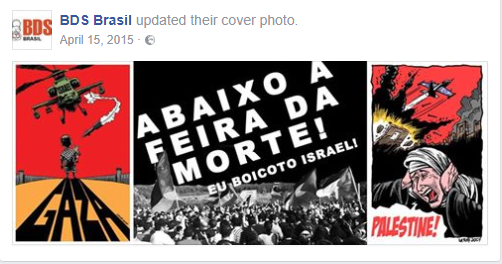 May 20, 2015 Members of EAPPI - Brazil spoke at “International Week Against Israeli Apartheid”. Latin American countries that abstained are Argentina, Colombia, Dominican Republic, Haiti, Mexico, and Panama. Latin American countries that voted against the UN vote are Guatemala and Honduras. Signatories to the call include the Palestinian Boycott, Divestment and Sanctions National Committee (BNC), Palestinian Environmental NGOs Network (PENGON), Palestinian NGO Network (PNGO), Addameer, Applied Research Institute Jerusalem (ARIJ), Defense for Children International – Palestine (DCI-P), Jerusalem Legal Aid and Human Rights Center (JLAC), Ma’an Development Center, MUSAWA, Palestinian Agricultural Relief Committee (PARC), Popular Struggle Coordination Committee (PSCC), Union of Agricultural Work Committees (UAWC), Women Center for Legal Aid and Counseling (WCLAC), Association France Palestine Solidarité (AFPS), Association Belgo-Palestinienne, CODEPINK, Grassroots International, Jewish Voice for Peace, Friends of Sabeel, US Campaign for Palestinian Rights, and Westchester Peace Action Committee Foundation (WESPAC). Other signatories included Alternative Information Center, Palestinian Environmental NGOs Network- Friends of Earth Palestine (PENGON), Stop the Wall Campaign, Land Defense Coalition, Palestinian Farmers Union, Jewish Voice for Peace (JVP), CODEPINK, US Campaign for Palestinian Rights, Association Belgo-Palestinienne, Association France Palestine Solidarité (AFPS), Adalah-NY, Palestine Solidarity Campaign, and Red Solidaria contra la Ocupación de Palestina (RESCOP) – a network of Spanish BDS NGOs.